Open access to information—the free, immediate, online access to the results of scholarly research and the right to use and re-use those results—has the power to transform the way research and scientific inquiry are conducted. It has direct and widespread implications for academia, medicine, science, industry, and for society as a whole. October 20-26 has been declared International Open Access Week, an opportunity for education and advocacy regarding the open sharing of information. Visit the Open Access Week website for more information about events being held around the world. 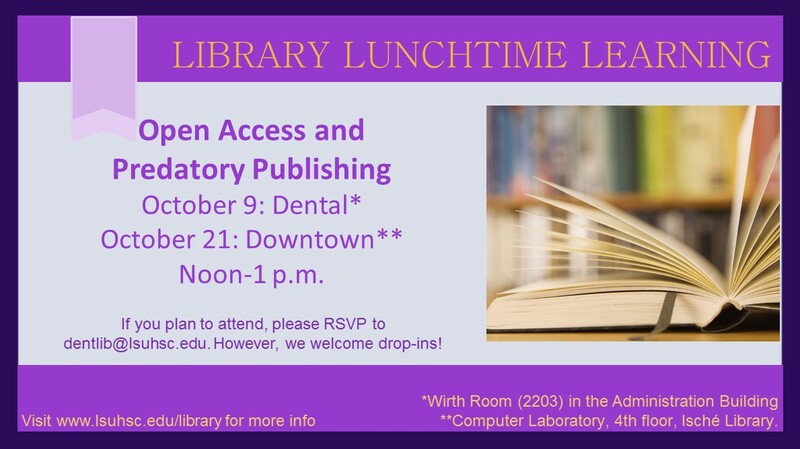 In honor of Open Access Week, LSUHSC-NO will be offering a Library Lunchtime Learning workshop on the topic tomorrow, October 21, at noon in the Computer Laboratory on the 4th floor of the Isché Library. We hope to see you there! Tags: open access | Library Events, Library News | Permalink | Comments Off on Happy International Open Access Week | Posted Monday, October 20, 2014 by Premo, Rita L.
Lab-bred bird flu research: bioterror threat? An interesting article in the Times Picayune today discussed how the US government is requesting two major scientific publishers (Science and Nature) restrict details about the development of lab-bred bird flu in upcoming publications. The NIH funded research was conducted in the Netherlands and at the University of Wisconsin, in order to study the epidemiology of H5N1 avian influenza. “…In a statement, Science editor-in-chief Dr. Bruce Alberts said his journal “has concerns about withholding potentially important public health information from responsible influenza researchers” and was evaluating how best to proceed. Nature’s editor-in-chief, Dr. Philip Campbell, called the recommendations unprecedented. After review by the US government’s biosecurity advisers, the Department of Health and Human Services requested the two journals not publish the full genetic information of lab bred bird flu, fearing it could fall into the wrong hands. The AAAS has a useful if dated Issue Brief explaining these methods of publication control in their document “Science and Security in the Post-9/11 Environment-Scientific Publication Policies” (2004), as well as a link to resources and primary documents related to the regulation of scientific information (which is not unprecedented…hello, atomic bomb! ).